I had an old voicemail in the Verizon voicemail system that I wanted to save for sentimental reasons. Verizon does not provide a way to download voicemails, so I had to find an alternate solution...preferably free. This method could be used for phones other than iPhone (even land-lines), but my instructions are tailored to the 3-way calling method on iPhone. Turn off your forwarding phones so they don't ring. Dial your own cell number to get the voicemail system prompts. Tap Keypad. Input your password, and let the voicemail system prompts continue. Then tap Hide Keypad. Tap Mute to mute your own voice while you wait for the Merge Calls to become available (I had to wait about 15 seconds). Then tap Merge Calls. The Google Voice call will ring, and then Google Voicemail will pick up and start playing your greeting. BEFORE you hear the Google Voicemail beep, tap 1 (on Verizon) to start playing your voicemails on the Verizon system. 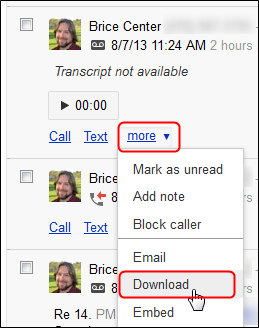 If you wait until after the Google Voicemail beep, pressing 1 will actually end the Google Voicemail prematurely. Undo the changes made to Google Voice Settings to re-instate your Google Voicemail on your Mobile, your Direct Access, and your Forwarding phones (reverse the prior instructions). Go to Google Voice on a computer. Find the voicemail in your inbox. Click "more ▼," then click "Download." Now you have an .mp3 of your old voicemail. If you want to trim the prompts before or after the actual voicemail, use the great free program MP3DirectCut to losslessly trim your mp3.